Home inspectors can be thought of as "House Doctors." body. Home Inspectors must understand the structure, foundation, construction materials, and the mechanical systems. Home Inspectors must understand both the componants of a home and how the components relate to each other and the total structure. Unlike a doctor home inspectors don't "Treat the Patient" by making repairs. 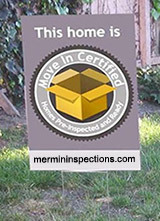 Also known as a Pre-Listing Inspection. This type of inspection is requested by the seller. It gives the seller the opportunity to start a Top Notch Marketing Plan. It makes it possible for the seller to recognize any potential problems, repairs, or safety concerns prior to putting your home on the market. Also known as the Buyers Inspection. Most home inspections are requested by the buyer. It gives the buyer leverage, or a bargaining tool. A tool to either negotiate price or to convince the seller to make repairs before the property sale is finalized. These inspections include: Roof Inspection, Electrical Inspection, HVAC Inspection. (heating,ventilation and air conditioning) and a Plumbing Inspection. Note:This is not the 4 Point Inspection required by insurance companies to write your policy. Also known as Phase Inspections. These inspections are performed during the following phases: Slab, Tie Beam, Dry Wall, Mechanical, and Punchlist or Final Walk Through. New Construction Inspections may also include Bank Draw Inspections. These may consist of photos & documentation of construction progress required by lenders prior to release of funds. No matter what type of inspection you need, it makes no sense to buy, sell, or build a home without the expert assistance of an experience and formally trained Home Inspector.